The Wi-Fi alliance has at last launched its next generation standard for Wi-Fi security. 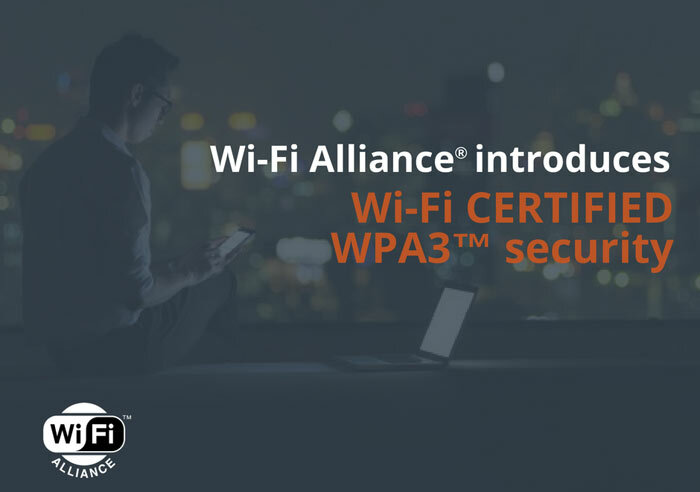 Wi-Fi Certified WPA3 is said to deliver new capabilities to personal and enterprise networks, make Wi-Fi security simpler, offer more robust authentication, and provide increased cryptographic strength - very important for highly sensitive data applications. WPA3 retains interoperability with WPA2, which was introduced about 14 years ago. Two other new Wi-Fi initiatives have been introduced alongside WPA3. Firstly, Wi-Fi Certified Easy Connect is a new program that reduces the complexity of onboarding Wi-Fi devices with limited or no display interface – such as devices coming to market for Internet of Things (IoT) - without sacrificing security standards. An example use case is in employing your smartphone's easy to use interface to securely add a screen-less device to your Wi-Fi network. Secondly, Wi-Fi Certified Enhanced Open "delivers improved data protections while maintaining the convenience and ease-of-use of open networks". It is intended for use by the likes of coffee shops, or in guest web portals used by venues such as airports, hotels and sports arenas. You know it. And it'll be the flimsiest implementation ever. given Virgin STILL haven't released a proper fix for the puma chipset drop-out issues in the s.hub3 chances of this getting a swift implementation are positively nil. Can they fix that in software? firmware? yes. kind of. they're finally trialling a patch but it's getting very mixed reviews and large packets still drop. it's just a rubbish chip.